Emma Cocker is a writer-artist and Associate Professor in Fine Art. Operating under the working title Not Yet There, Emma’s research focuses on the process of artistic endeavour, alongside models of (art) practice and subjectivity that resist the pressure of a single, stable position by remaining wilfully unresolved. Her mode of working involves an interdisciplinary, hybridised approach that unfolds restlessly along the threshold between writing/art, including experimental, performative and collaborative tactics for producing texts parallel to and as art practice. Emma’s role at NTU involves supporting the research activity within Fine Art, alongside teaching across the full interdisciplinary Fine Art programme from undergraduate to postgraduate and doctoral level. She currently convenes and chairs the Fine Art Contexts Lecture Series, a programme of research-informed teaching for interrogating the critical contexts for contemporary fine art. Emma has a specific interest in artistic research, and in writing’s relation to artistic practice including writing in-with-and-through practice, writing-as-practice, alongside various ‘expanded’ forms of writing, language and text-based work. Emma Cocker is interested in supervising research students working on issues and questions related to her own research practice. See “Research” for more information. Emma has an international research profile involving publication, performance, exhibition and guest lecturing. Emma joined NTU Fine Art in 2005, having previously taught at various HE institutions. From 1999 – 2004, she was Education Development Manager at Site Gallery in Sheffield, where she was responsible for curating the public programme including symposia and conference, as well as projects, events, and workshops with diverse audiences. Emma has a BA in Fine Art, MA in Visual Culture and MRes in Contemporary Art History, Goldsmiths. The Process of Practice – focusing on the process of artistic endeavour and the experiential knowing-thinking-feeling therein, asserting value for this habitually unseen, undisclosed or often unsharable aspect of an artist’s/writer’s practice. What is at stake in the shift of attention from the measurable outputs of artistic activity to a heightened awareness of its qualitative processes: the thinking-in-action activated within practice, the unfolding decision-making, the navigation of competing forces, the activity of working with and through obstacles or of ‘figuring’ something out? This enquiry is concerned with prolonging, emphasising and honouring the space of indeterminacy within artistic process, investigating the potentiality of a form of ‘thinking’ that precedes and might indeed be different to ‘knowledge’. Practising the Self – existing in the space between art and philosophy, ethics and aesthetics, this enquiry explores different artistic practices that seemingly operate as contemporary manifestations of the Ancient Greek ‘practices of the self’ where life is conceived as a malleable material that can be approached (in Foucault's terms) as if it were a ‘work of art’. It involves an exploration of tactics through which the experience of self is pressured towards its limits, where the illusory boundary between self/other or self/world becomes porous including through collaboration practices of being-with. Parallel enquiries address the relationship between how landscape is performed to the emergence of a critical, and potentially resistant, form of subjectivity; alongside investigating the capacity of participatory performance to intervene in or challenge how the public realm is activated and navigated through the rehearsal and testing of experimental forms of sociability or collectivity: performing communities. Tactics of Affirmative Resistance /Resistant Affirmation – this enquiry asks how might we resist or dislodge the ubiquitous demands to do more and more – faster and faster – that arguably underpin our contemporary culture of immediacy and urgency, of 24/7 access and availability, with its privileging of multitasking, perpetual readiness and ethos of ‘just-in-time’ production? How might not knowing, uncertainty, indeterminacy, the untranslatable or unexplainable alongside the non-teleological (non-action, doing nothing, non-doing) operate in critically resistant terms? An attempt is made to advocate critical value for open-endedness, failure and repetition as models of resistance to or refusal of the dominant progressive, goal-oriented tendencies of contemporary experience.Additionally, this enquiry explores how different creative processes affect and shape our lived experience of time, disrupting the linear perception of chronos, to reveal and bring into relation a plurality of experimental micro-temporal co-incidings? How might we organise or even score our time together (differently)? Extra Textual: Art/Writing – this enquiry addresses writing’s relation to artistic practice including art-writing, writing in-with-and-through practice, writing-as-practice, alongside various ‘expanded’ forms of writing, language and text-based work. It engages with the critical poetics of language, as well as its potential as a visual-material practice, alongside an interest in experimental reading and conversation-based practices. Emma is a member of the NTU Critical Poetics Research Group. 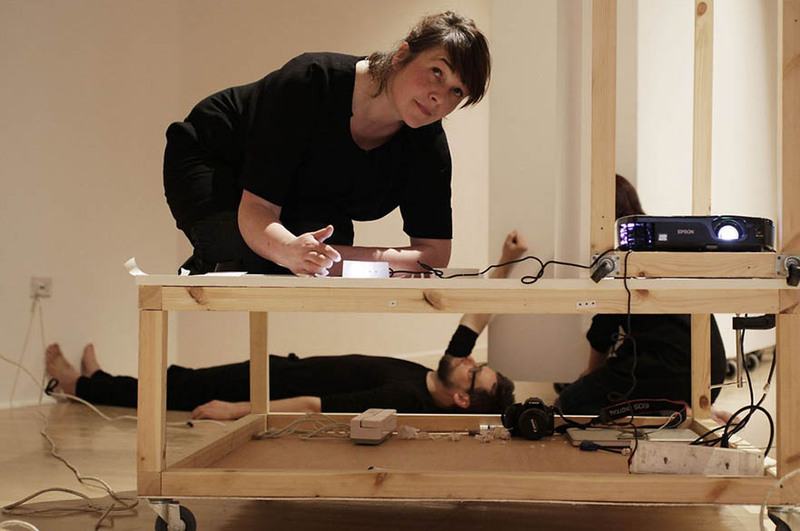 Emma often works in collaboration with other artists, as well as operating as an invited critical interlocutor within diverse research projects. She is currently a key researcher on the international, interdisciplinary research project Choreo-graphic Figures: Deviations from the Line, a collaboration with Vienna-based artist Nikolaus Gansterer and choreographer Mariella Greil (funded by PEEK, Austria). She was an invited critical interlocutor as part of the international research project Weaving Codes – Coding Weaves funded by the AHRC Digital Transformations Amplification (2014 – 2016), extending from her involvement in the previous AHRC research project, Live Notation: Transforming Matters of Performance, 2012. Previous artistic collaborations include working in dialogue with the performance-based collective Open City from 2007 – 2010 and The Italic I, an ongoing collaboration with Clare Thornton resulting in national and international exhibitions and publications. She has produced numerous artists’ books in collaboration with artists including Victoria Gray (Manual, 2014) and Sophie Mellor (Manual for Marginal Places, 2011), and has written essays on the work of various artists including Danica Maier (in Grafting Propriety, Black Dog Publishing, 2016), Ben Judd (in Communion, Black Dog Publishing, 2014); Vlatka Horvat (in In Other Words …, Bergen Kunsthall, 2011); Dutton and Swindells (in Institute of Beasts, Site Gallery, 2009); Karin Kihlberg and Reuben Henry (in Beginnings, VIVID, 2012), FrenchMottershead (in People, Places, Process: The Shops Project, Site Gallery, 2010), Cool and Balducci (in Dance Theatre Journal). Emma has presented papers and performance lectures nationally and internationally including at the universities of Copenhagen, New York, Toronto, Utrecht, Zagreb, Geneva, Japan; at artistic research events including Society of Artistic Research and Swiss Artistic Research Network symposia, as well as at various art and performance festivals including ImPulsTanz, Vienna and ANTI festival, Kuopio, Finland. From 2001 – 2005 Emma was co-editor of the publication series Transmission: Speaking and Listening (Site Gallery / Sheffield Hallam University). Between 2012 – 2013, she convened an international reading group exploring the notion of affect in collaboration with Site Gallery, Sheffield and the Amsterdam curatorial project If I Can't Dance … resulting in the published Reader, Reading / Feeling, 201). Emma is an invited member of the Research and Publishing Committee for LADA, the Live Art Development Agency; on the Editorial Board for The Journal of Architecture and Culture, and has been a peer-reviewer for Area, TRACEY, Rhizomes, ruukku, Journal of Visual Arts Practice, Journal of Art, Design and Communication in Higher Education and Project Anywhere. Previously she was a Trustee for S1Artspace, Sheffield, and a member of the Executive Committee for engage, the national association for gallery education. Alongside her academic publications and artists’ books, Emma’s writing on contemporary art has been published in magazines/journals including Frieze, Camera Austria, Dance Theatre Journal, The Art Book, drain, m/c, Journal of Writing in Creative Practice, art + research and Performance Research Journal. Her recent writing has been published in Failure, 2010; Stillness in a Mobile World, 2010; Drawing a Hypothesis: Figures of Thought, 2011; Hyperdrawing: Beyond the Lines of Contemporary Art, 2012; Reading/Feeling, 2013; On Not Knowing: How Artists Think, 2013; Choreo-graphic Figures: Deviations from the Line, 2017; The Creative Critic: Writing as/about Practice, 2018, and as a solo collection entitled The Yes of the No, 2016.